Chimera is a welcome return to form for the seventh season of Star Trek: Deep Space Nine, following an underwhelming run of episodes from Prodigal Daughter through The Emperor’s New Cloak and into Field of Fire. It is another example of how storytelling real estate in the seventh season is at a premium, the production team understanding that their remaining time is finite and that there are a number of key plot and character beats that the show needs to hit before it can begin the massive final arc that will run from Penumbra through to What You Leave Behind. As such, Chimera has a very clear purpose in the overall arc of the seventh season. As with Treachery, Faith and the Great River, this is an episode designed to clarify that Odo cannot remain on Deep Space Nine forever. However, Chimera is more than just the writing staff moving pieces across a chessboard. It is in many ways an exploration of one of the fundamental (and often unspoken) tensions within the larger Star Trek universe. As with a lot of Deep Space Nine, there is a sense that Chimera is consciously exploring and interrogating some of the underlying assumptions of Gene Roddenberry’s massive universe. In particular, Chimera is an episode that wonders whether mankind can ever be truly comfortable with the alien, and whether there is a difference between assimilation and multiculturalism. The result is a powerful and provocative piece of science-fiction, a story that has aged as well as the show around it. Chimera is a story about what it means to be different, and what it means to part of a society. It is a cautionary tale about the unspoken conditions that are often attached to membership of a community, and of the conflict between blending in and standing out. Faith can be a tricky issue. It is a short conversation, but one that reveals a lot about Star Trek: Deep Space Nine. As a rule, the Star Trek franchise tends towards a strong atheism, rejecting notions of religion and spirituality as the hallmarks of an underdeveloped civilisation; Return of the Archons, The Apple, For the World is Hollow and I have Touched the Sky, Who Watches the Watchers?, Devil’s Due, False Profits, Chosen Realm. This makes a certain amount of sense, given that the franchise prides itself on its rationalism. However, it also feels a little narrow-minded. Rapture might just be the franchise’s most compelling exploration of unquestioning faith, a harrowing portrayal of devotion and inspiration that captures at once the ecstasy of unwavering belief and the discomforting aspects of watching someone embrace something outside a rational frame of reference. Rapture is a mesmerising piece of television. It is suggested that hell is other people. Perhaps not so much. Perhaps hell is the absence of other people. Towards the end of The Drop, a character ruminates on the idea of eternal damnation – suggesting that hell is nothing but eternal emptiness, a cosmic echo chamber where the damned are left with nothing but their own sense of isolation. Maybe that is what damnation is, nothing but an individual’s own loathing and self-doubt reflected back them, amplified through the darkness. 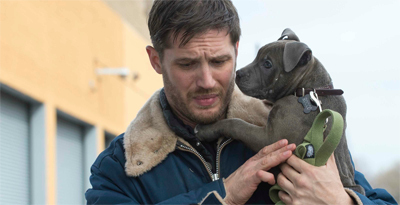 The Drop is a tense and claustrophobic thriller. The bulk of the action unfolds around the small world as Bob knows it. Bob is a simple man. He works at a small dive, “Cousin Marv’s Place.” When asked tough questions, he simply answers, “I just tend bar.” As Bob explains, the dive bar occasionally serves as a “drop” for all the money laundered through local crime. Bob doesn’t know where it comes from or where it goes. He is only aware of it when it comes into his care and when it leaves. The Drop is a story about isolation and loneliness. Characters reflect on their place in the world, trying to make sense of what unfolds around them. Most are unknowable to each other, mysteries and enigmas. Asked a personal question, Bob replies, “That’s my business.” When his friend Nadia asks why Bob never inquired about her own very obvious scars, Bob simply answers, “I figure that’s your business.” The world as Bob knows it is a small place. Maybe it’s constantly getting smaller. Adapted by Dennis Lehane from his own short story Animal Rescue, The Drop wallows in its own sense of lost direction and impending doom. Michaël R. Roskam’s direction never rushes the story or the actors, allowing the film time to take in the emptiness and hollowness in this small world that briefly intersects with something much bigger and more unpleasant. Perhaps a little too stately and relaxed in places, The Drop is nevertheless an atmospheric delight.